Can Saudi Arabia Drill Its Way to a Greener Future? 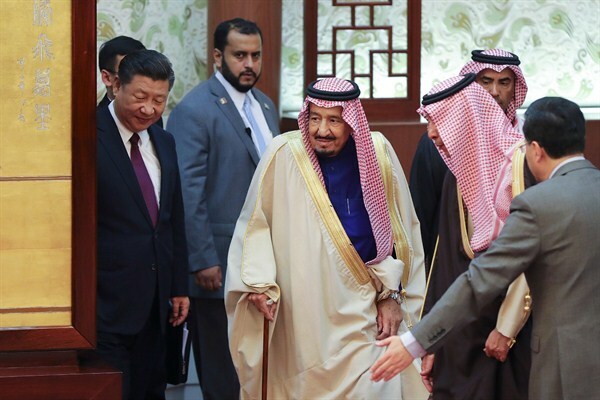 King Salman of Saudi Arabia and China’s president, Xi Jinping, arrive for a signing ceremony at the Great Hall of the People, Beijing, China, March 16, 2017 (Lintao Zhang pool photo via AP). As the worldwide movement to combat climate change gets underway in earnest following the 2015 Paris Agreement, oil-rich Saudi Arabia finds itself in an awkward position. The world’s largest producer of fossil fuels, the kingdom needs to pump ever-increasing amounts of oil to support a rapidly expanding population in a new era of relatively low global oil prices. But the hot, arid country is one of the most vulnerable to the effects of rising temperatures. There is the distinct possibility that if the emission goals of the Paris Agreement are not met, some areas of the Arabian Peninsula, including Mecca, may become so hot that they are uninhabitable by the end of the century.